I haven't posted much this month. I've been starting a number of projects, but have nothing to show for the effort yet...but soon! The LGS is running the new Charsaug league for Warmachine. I won't be able to play many games, but I will be trying to earn as many hobby points as I can. So...starting work on the most difficult model I'll face in this hobby challenge...Galleon. As usual, cleaning the horrendous mould lines and flow gates off the resin has proven to be the biggest challenge so far. However, the major assemblies are together and ready for painting. I'm going to go with a rusty green and brass paint scheme, which I think will move along pretty quickly. I'm also doing a Vanguard light jack at the same time in the same scheme. However, what's been occupying most of my time is a new batch of Middle-earth figures. Concentrating on men this time. I have a selection of men from the Gondor fiefdoms, Dunland, and a few from Arnor. They are still on the painting table. 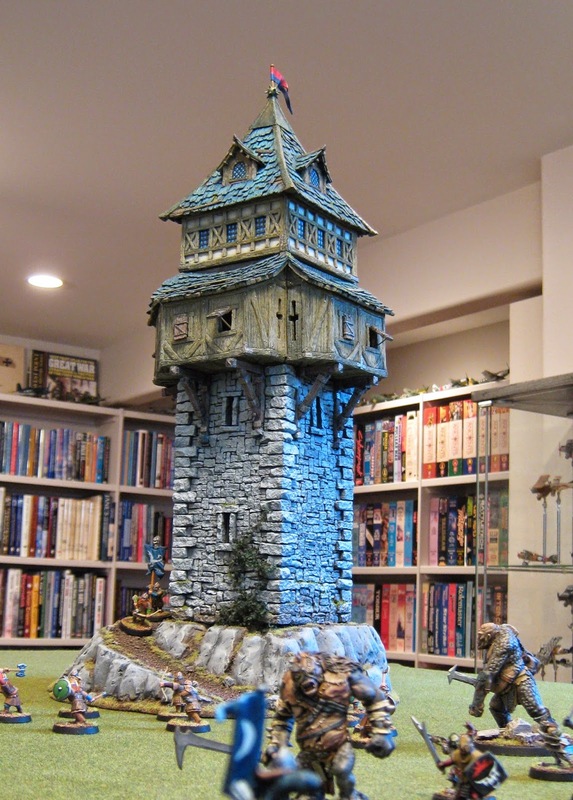 In other news, Tabletop World, which casts wonderful 28mm buildings, is having a Facebook painting contest. I've photographed a few of my pieces and sent them in for consideration. Anyway, I should get some models off the table shortly. On the continuing journey to build up a couple of 10-12mm sci-fi armies, the time has come to add some air power. I have some Dropzone Commander aircraft on order, but while I'm waiting for them to come in, I went out and bought a 1/144 scale Chinese stealth jet, the J-20. This stealth fighter is due to enter service at the end of this decade. So, seeing as it's not in service yet, it looks high tech, and is generally unrecognizable to North American eyes, I figured this model makes a good sci-fi jet. Not a complex model...particularly since I was going to paint over the canopy and build it with the landing gear retracted. Here the model is built and is ready to take it's primer coat. The base color was black. Over top of that I sprayed dark grey to give it that matte look. Next I started planning out a muted camouflage pattern. The Chinese jet, like some of the American stealth aircraft, is a matte black. However, as a sci-fi piece, I have the luxury of just making something up. So. I decided to do a patchy black/dark brown/dark green camo pattern. So, the first order of business was to mask off the black patches. I used some tacky putty. Next, I over-sprayed a dark brown and then highlighted that with a medium brown. ...and then filled in the spaces between the patches with tape. After spraying with a dark green and highlighting with a pale green, I removed all the masking material. I was super happy with the result. The scheme feels familiar, but has a good military sci-fi aesthetic. Familiar and not at the same time. All that was left to do was hand-paint the engine nacelles, canopy and running lights. The model got an over-spray of floor wax and a few decals were applied. The final dullcoat spray sealed everything up, and the model was done. I'll mount it on a flight stand later. Hopefully, I'll get those next Dropzone Commander models in this week and have them on the table for next weekend. Recently I've completed some 12mm mechs and infantry stands from the Heavy Gear franchise. They got me interested in building up a couple of sci-fi armies. I started looking around for other models to round out a combined arms force. The vehicle models from Dream Pod 9 (Heavy Gear's manufacturer) are just way too expensive to consider...and really, there weren't good quality cheap alternatives. However, I was intrigued by the aesthetic of Hawk Wargames' Dropzone Commander UCM vehicles. Although these models are 10mm scale, they are a close match for the Heavy Gear stuff. And they look good. I ordered some. Here are some Bear APCs. I was suspect of the lateral mould break...there were going to be some nasty gaps to fill. Also got some Longbow Howitzers. These artillery pieces are real beauties. This is the Kodiak command vehicle. A variant of the Bear...so same mould gap issue. Wolverine buggies. These fast attack cars can be built with chain gun or rocket pod armaments. Here is an assembled Bear. As I suspected, the gap right through the middle of the vehicle is a real problem. The Howitzers went together like a dream. Really like these models. And the buggies are very cool. The Kodiak, with its trailer. This is going to look really good once the radar dish is mounted. Putty for all the APC chassis. Nasty. Had to apply and scrape down several times. Once the tape was removed, I was left with a pretty interesting looking camo pattern. To finish the models off, they got a blue-black wash and details like windscreens, guns, tires and lights painted in. They were then sprayed with floor wax and decals were applied. A final spray of Dullcoat flattened out the finish. And these are the buggies and howitzers. And here's how the models mix in with the Heavy Gear mechs and infantry stands. I've ordered some stands to mount these new models on...when they arrive I'll do the bases. Anyway, I think this mix of models (along with some aircraft and tanks to come) will make a nice 10-12mm sci-fi army.